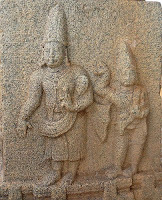 Persia (Iran) and karnataka had intensive relations since ancient times. Each influenced each other to a great extend in all fields , let us explore the unique relationship. The unfavorable condition of Northwestern part of India(Pakistan, Afghanistan), under Darius I is aptly described in Behistan Inscription. He describes how he captured the Magu king and killed. The Samkiccha Jataka describes the same story - 'Yo cha Raja Adhammattho Mago tapayitva Janpadam, Tapne pecca paccati'. What is the relevance of this King Darius of Achaemenid Dynasty who ruled Iran(Persia) to Karnataka. Many people unable to bear harshrule migrated from these regions and settled in several colonies under parashuram leadership from Gujarat to Kerala. Thus was started the migration of Paisachi Prakrit speaking people into Karnataka radically altering the demographic and geo- political landscape. In fact satavahana inscriptions show many paisachi words. Many of them settled in Maharastra especially Aparanta(konkan) region and vidarba region. One Group went south through karnataka and one group through Andhra and another through western coast to kerala and Tamilnadu and eventually Lanka. In The Nittur Edict(Bellary) Ashoka Calls Himself The Ruler Of Parthia, "Mahalake hi vijitam" ('Vast is my empire'), proclaims Ashoka, but how extensive really was his dominion in the West? In the Nittur Edict he explicitly calls himself the king of Pathavi - an unmistakable allusion to Parthia or Parthava of the Achaemenian records of Darius. Writers like Romila Thapar attempt to explain this away by suggesting that Pathavi corresponds to Prithvi, or the Earth, and that the statement only demonstrates royal vainglory. A world emperor like Ashoka who sent missionaries to kings of many other parts of the Earth surely was not so foolish as to call himself the ruler of the Earth. The Edict shows he is also ruler of parthia (Persia – Modern Iran). This explains the wide contact between Karnataka and Persia since earliest times.Significance of Nittur Inscription reveals persia(Iran) was under Ashoka Rule. 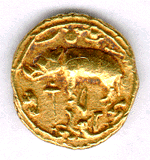 Around 625-26 AD , Chalukya King Pulakesin II (AD 610-42) exchanged envoys with Sassanian King Khusrau II (AD 596- 626). The same has been depicted in Ajantha Cave I. This information is also mentioned by persian historian Tabari, who says in the 35th year of Khusrau perviz reign an Indian King Pharmeish or paramesa(parmeswara - title of pulakesin) sent to an ambassador carrying letters and presents to monarch and sons.The return embassy by Khusrau is depicted in Ajanta. With the defeat of Harsha by pulikesin II and his successor Yasovarman by Vinayaditya the whole of India was under the chalukyas. Great ruler Vinayaditya realised the value of strong persia against the Arabs which was under Islamic Invasion. So he sent a battalion to protect the persia. The chalukya records show that the tribute was paid for protection by Kamera (Khamer or Combodia), Parasika (persia) and Simhala (Lanka). Visionary Vinayaditya sent a ambassdor to chinese Kao-Tsung as well. This is confirmed by Ma-Twan- Lin, who says Indian Emperor Tche-Leou-k'I-Pa-Lo(chi-lu-khi-pa-lo) or Chalukya Vallabha sent an ambassador (date 692AD). With the decline of persia, During Vikramaaditya II (733-745 AD) reign an Arab attempt to penetrate into the Deccan was thwarted by Avanijanashraya Pulakesi, the Chalukya general of Lata. Persian travelers who visited Malkhed at the time of Rastrakuta's spoke of the monarchs of Rastrakutas Dynasty as 'the Emperors of Hindustan'- among the most powerful rulers of the period. The Rastrakuta's provided protection to Zorastrians fleeing persia in India. Records show large trade between persia and Rastrakuta Empire. The persian account Hudud al alam(982AD) mentions rastrakuta and chalukyas as the Bhallaraj(Srivallabha – Chalukyas and Rastrakutas) of kamkar (karnata). The persian account also claims that Rastrakuta and pratihara's were enemies of Pala. Kannauj was under poessision of Rastrakuta for a considerable time. And aptly it adds Rastrakutas as the Emperors of Hind. Masudi calls even Khandahar as the country of Rahbut(Rajputs are of karnataka origin) , which puts karnata rulers in the neibhourhood of Persia. Masud calls them Chach (seems to be Rajputs of Chalukya origin). Curiously Rajputs of that area (Sindh and Baluchistan and Punjab of pakistan) call themselves Bhatti Rajputs, Janjuas have always claim descendancy from Pandavas. Name Bhatti(Bhatt) and pandavas(Matrilineal society) can be only be a community that is from Coastal Karnataka around Mangalore. May be the community developed out of chalukyan expedition against Arabs and settled there. Janjuas rajputs gave rise to famous Janjuas shahi dynasty (though they did not call themselves shahis, they are named shahis because they immediately succeeded shahi dynasty and resisted Ghaznavids invasions. Aihole inscription gives vivid account of flourishing trade between karnata and persia. Travelling both land and sea routes, these merchants traded mostly in precious stones, spices and perfumes, and other specialty items such as camphor. Business flourished in precious stones such as diamonds, lapis lazuli, onyx, topaz, carbuncles and emeralds. Commonly traded spices were cardamom, saffron, and cloves, while perfumes included the by-products of sandalwood, bdellium, musk, civet and rose. These items were sold either in bulk or hawked on streets by local merchants in towns. While eastern Chalukyas controlled the eastern seaboard, The Western Chalukyas controlled most of South India's west coast and by the 10th century they had established extensive trade ties with the Tang Empire of China, the empires of Southeast Asia and the Abbasid Caliphate in Bhagdad, and by the 12th century Chinese fleets were frequenting Indian ports. Exports included textiles, spices, medicinal plants, jewels, ivory, rhino horn, ebony and camphor to Dhofar, Aden and also Song dynasty in China. The final destinations for those trading with the west were Persia, Arabia and Egypt. The thriving trade center of Siraf, a port on the eastern coast of the Persian Gulf, served an international clientele of merchants including those from the Chalukya empire who were feasted by wealthy local merchants during business visits. An indicator of the Chalukyan merchants' importance in Siraf comes from records describing dining plates reserved for them. In addition to this, Siraf received aloe wood, perfumes, sandalwood and condiments. The most expensive import to karnataka were Arabian horse shipments, this trade being monopolised by Arabs and local merchants. 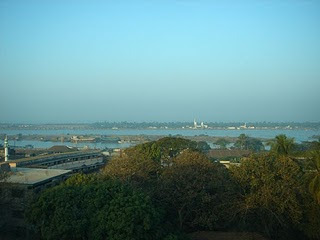 The Western coast was the responsibility of Gujarat Chalukyas, Silharas and later Kadambas. All the three took great care to cultivate good relations with persia and Middle east. Awe-struck by the splendor and prosperity prevailing in the Vijayanagar Empire, Abdur Razaak said,- “The pupil of the eye has never seen a place like it and the ear of intelligence has never been informed that there existed anything to equal it in the world”. Abdur Razaak was the Persian ambassador who had visited Vijayanagara in 1446. Persian Ambassador Abdul Razak graphic discription of Mangalore, Bhatkal, Honavar is significant. Mangalore, Bhatkal and Honavar were international ports in Vijayanagar times trading with Arabia and Persia. During the reign of Vijaynagar dynasty’s ‘Pepper Queen’ Ambakka, an ascription given by the Portuguese whom she had defeated. Indian spices including black pepper, cloth, rice, medicines, jaggery, sugar etc. were in great demand in Middle East, Europe and Mediterranean countries. These were produced in abundance in all the coastal belt. More than a dozen chiefs ruled in this region whose area at times, did not exceed more than 100 – 200 villages. Prominent among them were Santras (Bairaras) of Karkal, Bangas of Bangadi (Nandavar), Sawants of Mulki, Choutas of Mudbidri & Ullal, Ajilas of Venur, and Tolahas of Sura. These chiefs fought among themselves and with local administrators of Vijayanagar, most of the time, to become independent or for reduction fee in tributes and subsidies. But the strong Central Government of Vijayanagar had kept them under control, with overall supervision of Nayakas of Keladi. Over time, Some Persian-Arab traders decided to settle Bhatkal and that sect got the name ‘Navayaths’, or newcomers. Food – has an intricate relationship with the Navayath people and their culture, the cuisine from Bhatkal is just that. Rich in cultural history with strands of cuisine from the Arab and persian world which eventually have blended with the local dishes of the land. The sultanate was founded on 3rd of August 1347 by governor Ala-ud-Din Hassan Bahman Shah, possibly of Tajik-Persian descent, who revolted against the Sultan of Delhi, Muhammad bin Tughluq. Nazir uddin Ismail Shah who had revolted against the Delhi sultanate stepped down on that day in favour of Zafar Khan who ascended the throne with the title of Alauddin Bahman Shah with first Gulabarga and then Bidar as capital. His revolt was successful, and he established an independent state on the Deccan. But soon the kingdom split into five sultanates. The Bahmani dynasty believed that they descended from Bahman, the legendary king of Iran. They were patrons of the Persian language, culture and literature. Some of the Bahmanid kings and princes took a personal interest in Persian, as well, and became well-versed in Persian language and literature. Hazrat Khwaja Syed Muhammad Gesu Draz, scholar of both kannada and persian, greatly encouraged the interaction between the two. Bahmani kings brought artisans from persia, Arabia and Turkey blending with local styles they built great many architectural wonders like Gol Gumbaz. The Bahamani army had soldiers from Turkey, Arabia and Persia. Mahmud Gawan arrived in Bidarfrom Persia in 1453. A great scholar of Islamic lore, he founded the Madarassa (college) from his own funds on the line of Universities of Samarkhand and Khorasan. A selefless worker, he became a prime-minister of Bahamani king Mahmud III (1462- 82) whom he tutored in earlier days. But Gawan became a victim of the palace intrigue and was beheaded by the drunkern king. The later kings of the Bahamani dynasty were too weak to keep the kingdom in tact, and this led to the breakup. Bahmani kingdom survived until babur took over. 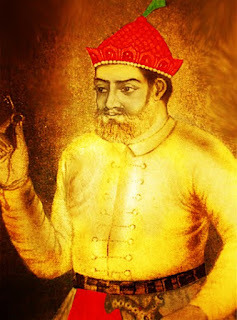 According to the historian Mir Rafi-uddin Ibrahim-i Shirazi, or Rafi', Yusuf's full name was Sultan Yusuf 'Adil Shah Sawa or Sawa-i, the son of Mahmud Beg of Sawa in Iran. Rafi's history of the 'Adil Shahi dynasty was written a the request of Ibrahim Adil Shah II, and was completed and presented to the patron in AH 1017. T.N. Devare mentioned that while Rafi's account of the Bahmani dynasty is filled with anachronisms, his account of the Adilshahi is "fairly accurate . Rafi's account is less well known than that of the popular historian Firishta, the author of the Nawras- nama, also known as the Gulshan-i Ibrahim. Rafi's account of the life of Yusuf 'Adil Shah directly contradicts a fanciful legend related by Firishta on the origins of the Adil Shahi dynasty. According to him, Yusuf Adil Shah is said to have been the son of Murad II, Ottoman sultan and caliph of Islam, who was succeeded by one of his sons, Mehmed II. After his accession, the new sultan is said to have ordered the execution by strangling of all his brothers, including Yusuf. Yusuf's mother contrived to save him by replacing him with a slave boy; she then arranged to have Yusuf conveyed to Persia. Yusuf eventually came to India, where he took service under the Bahmani ruler of the Deccan, ultimately becoming a personage of importance at the court of Mahmud II. Kannada, Persian and Arabic were court languages in Bahmani kingdom. Many of scholars in Bahmani court were well versed in both. During Mughal rule kannada elements were taken into persian by the local scholars when they went to Mughal Imperial court. Tipu sultan also made persian and kannada as court languges. The direct interaction between Kannada (and Telugu, Marathi) and Persian along with Arabic has given a unique blend of Urdu called Deccani and it has large number of Kannada, Telugu and Marathi words. Persian historian Tabari gives vivid accounts of Chalukyas under pulikesin. In 1017 A.D., at the behest of Sultan Mahmud of Persia, Alberuni (a.k.a. Al-Biruni) traveled to India to learn about the Hindus, "and to discuss with them questions of religion, science, and literature, and the very basis of their civilization". He remained in India for thirteen years, studying, and exploring. Al beruni gives a vivid accounts of Rastrakutas and karnataka. Persian historians give account of the glory of seunas of Devagiri. Persian accounts such Burhan-i-Ma'asi , Janjira Nawab , Riyazul Insha have greatly helped in the stitching together the history in south India and karnataka in particular. Writings of Nuniz confirms that the kings of Burma paid tributes to Vijayanagara. Famous historian Muhammad Qasim Firishta (1560 – 1620) lived in court of Adilshah and wrote Khulasatu-t Tawarikh. Firishta not only gives vivid account of extend of Gazni raids but also the ruthlessness with which local people, temples and property destroyed by muslim rulers. It gives the vivid accounts of Bahmani rulers. Timurid Abdur Razzaq persian Ambassador to VijayNagar Empire court during the Great Krishna Deva Raya gives vivid account of the Empire and the Emperor. Afanasy Nikitin Russian traveler of 15th century who visited Bahmani and VijayNagar kingdoms says, There were many people coming from Khorassan (north east of Iran) Bahmani kings kept close link with the region and scholars were invited to settle in Bidar by Muhammad Gawan. Cosmas Indicopleustes of the 6th century talks about Churches Persian bishop at Kalliana (Kalyan) then under Kadambas. Ahbar as-Sin wa'l-Hind the Arab accounts of 9th century speak of flourishing trade between Karnataka and persia (and Middle east). Al beruni pays glowing tributes to Rastrakuta regime saying that the only country where muslims were allowed to practice the religion unhindered. He also talks about the trade ties between persia and then Rastrakuta empire. The Bahmani kings first started giving inscriptions in persian and Arabic along with local languages Kannada, Telugu and Marathi. Large number of Inscription have found of Bahmani rule, subsequent Mughal dynasty, also Hyder Ali and Tipu Sultan regimes. Some scholars say , Hindustani music is a rich combination of Carnatic music and traditional persian music in Bahmani rulers courts. While carnatic music flourished south of Krishna(VijayNagar Empire), Hindustani flurished in north of Krishna(Bahmani sultanates). Bijapur ruler Ibrahim II composed Kitabe Navras to introduce Hindu music to the Muslims and the book begins with an invocation to Saraswati and Ganapati. Thus started the Sufi tradition. 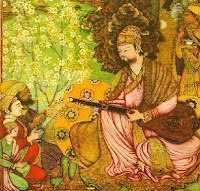 When Mughals took over Bahmani kingdom, music went to North to Delhi Courts as well. Meanwhile Carnatic music was not insular to persian influences, Persian modes came to be grafted and the new ragas like Darbara and kalyana were evolved by saints like Purandara. The Bahamanis introduced the large scale use of paper in administration and began the Indo-Sarasenic architectural style, designed and constructed by Persian architects and artisans, (also known as Deccani architecture) with its local influences from Karnataka.The Sultanate monuments of Bidar and Gulbarga are testimony to their interest in architecture. 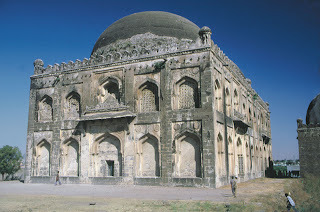 The Bande Nawaz tombs and a Jama Masjid in Gulbarga which exhibits a persian influence are well known. In Bidar, their buildings have Persian, Turkish, Arabic and Roman influences (the Solah Khamba mosque being an example).Rangin Mahal, Gangan Mahal, Tarkash Mahal, Chini Mahal, Nagina Mahal and the Taqk Mahal are some of the palaces built by them that have retained their beauty. The Ahmad Shah Wali tombs are noted for their decor, and the school of learning (madrasa) built by Gavan in Bidar (1472), with its lecture halls, library, mosque and residential houses are also famous. The contributions of the Bijapur Sultanate in the Indo-Saracenic idiom to the architectural landscape of Karnataka is noteworthy. Their most famous monuments are the mausoleums called Ibrahim Rauza and the Gol Gumbaz apart from many other palaces and mosques. The elegance, finish and beauty of Mehtar Mahal is claimed by a historian to be equal to anything in Cairo. Their Kali Masjid at Lakshmeshwar is a synthesis of Hindu and Muslim styles. 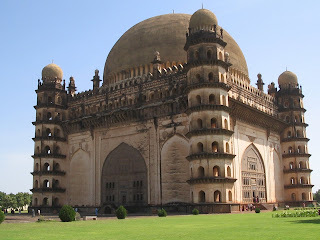 The Ibrahim Rauza built by Ibrahim II is a combination of a mausoleum and a mosque and is called the "Taj Mahal of the Deccan".The Gol Gumbaz built by Muhammad is the largest dome in India and the second largest pre-modern dome in the world after the Byzantine Hagia Sophia with an impressive "whispering gallery". Some historians consider this one of the architectural marvels of the world. 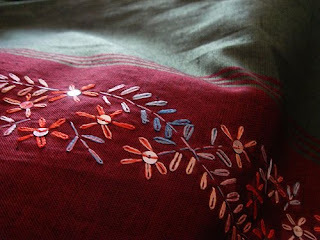 The word kashida is derived from the Persian word meaning embroidery. This shows that there were contacts between Persia and Karnataka since the reign of Chalukyas in the 6th century A.D. Traditionally designs are worked out on the web of black Irkal handloom saris-the warp and weft of the fabrics regulated stitches. It was worked by counting threads and without knots, hence is identical on both sides. This type of embellishment is usually done by four varieties of stitches namely Ganthi- line or backstitch, vertical, horizontal and diagonal. Murgi- zig zag, it runs up and down like steps of a ladder. Negi, weaving stitch and Menthe-forked branch or cluster stitch resembling fenugreek seeds. According to one version, Abdullah-bin-Khaiser, an expert in bidriware, migrated to Bidar in the 11th century and joined hands with an equally proficient goldsmith familiar with the secrets of the trade. Together they gave impetus to the craft. Another popular tale recounts that one of the Hindu kings of Bidar innovated the crafts of bidriware, using the articles thus decorated to hold flowers and other offerings in honor of his household Gods. Later, under the patronage of the Mughals, indigenous manufacturers were extended both co-operation and encouragement and in course of time, bidriwork reached its zenith in perfection, design and finesse. Process of Making Bidriware The origin of the technical aspect of bidriware is not definitely known. It appears that like other Persian articles of metal, this particular type of work was probably developed by experimenting with various alloys to guarantee brilliance by contrast. The resultant ingredient was an alloy of zinc and copper combined with other non-ferrous metals. The new alloy, thus produced, is brittle but does not rust or corrode and has the additional advantage of allowing a better polish. Each bidri utensil has to pass through a long complicated process of casting, polishing, engraving, inlaying and blackening of the alloy before the final product is ready for the market. The Persian wheel is a mechanical water lifting device operated usually by draught animals like bullocks, buffaloes or camels. It is used to lift water from water sources typically open wells. In Sanskrit the word Araghatta has been used in the ancient texts to describe the Persian Wheel. The ‘ara-ghatta’ comes from the combination of the words ‘ara’ meaning spoke and ‘ghatta’ meaning pot. There is evidence to argue that this system of lifting water from open wells was probably invented in the India of the past. With its use also in Iran, the then Persia, and perhaps its discovery there, it came to be called the Persian wheel. The celebrated writer philosopher Ananda K Coomaraswamy in his monograph ‘The Persian Wheel’ argues that it is not justified to draw its origins to Persia as it finds mention in the Panchatantra (3rd Century BCE) and the Rajatarangini (12 th century CE) as the ‘cakka-vattakka’ or the ‘ghati yantra’. 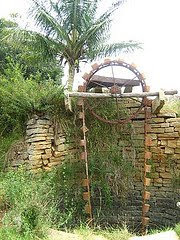 Persian wheel represents a water culture and water heritage of India. It therefore seems imperative to document and preserve the knowledge base around this instrument which was both a function and an indicator of the ecological availability of water at shallow levels. The great water heritage still practiced in Karnataka should be preserved. The Rastrakuta empire records while decribing Agriculture ,explains about Persian wheel technology. The Vijaynagar empire promoted both persian wheel and Ghanat system (originated in persia) for irrigation. As you can see the relations is very vast and we need a chair either at Gulbarga, Bijapur or Bidar Universities with a counterpart in Iran to study each aspect in this long interaction between karnataka and Persia on the one hand and Kannada and Persian on the other.